Women attending university a century ago were few and far between. The movement was growing, but they found strength – and peer to peer mentorship – in numbers and the Canadian Federation of University Women was born. The national organization celebrates its 100th anniversary this year and, closer to home, the Aurora-Newmarket chapter, which draws membership from across York Region and South Simcoe, is celebrating its 60th anniversary this month with a special celebration. 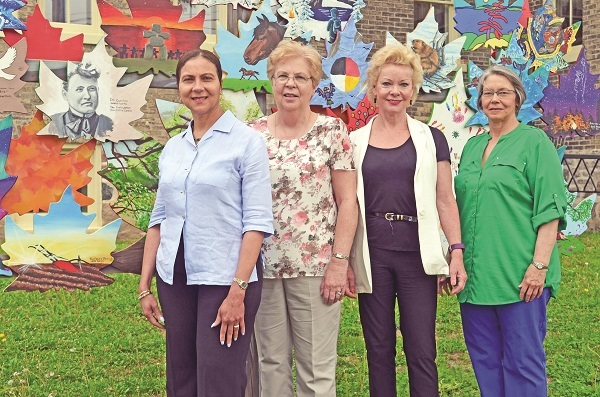 While the Canadian Federation of University Women (CFUW) Aurora-Newmarket is marking the milestone by presenting An Evening of Art, Music & Laughter at the Aurora Cultural Centre on the evening of June 14, they are also celebrating its evolving and growing mandate within the community. Numbering 208 members as of this year, the CFUW has marked a number of important milestones over the last 12 months. They have partnered with the Children’s Aid Society for a new “Stay in School” program benefiting young women who are wards of CAS who are going onto higher education, provided thousands of dollars worth of scholarships, and instituted new programs to encourage diligence in education across genders. The Federation is cognizant that “every reputable global organization” ranging from the United Nations to the International Monetary Fund all recognize the education of girls as a “major benchmark of how society will progress in societal development and stability,” says member Karen Strype, and that too is their mandate. “We really want to emphasize that because we realise its importance,” she says. But they also realise the importance of their own anniversary and in this milestone year they hope to not only build awareness of the Federation itself, but also build and foster what member Angie Wickham describes as “allies” to their advocacy work. “I think Aurora-Newmarket has been more of a social club, but we’re getting out now into advocacy and we find that all the work we are doing is not out in the public and we want to do that. We chose the Art, Music & Laughter theme for our celebration because of the composition of our club: we want to bring a little laughter into the event. The four women who sat down with The Auroran to discuss the anniversary each discovered the club at different times, each seeking out different things and being attracted to the organization for different reasons. For some of them it was networking, for others it was sharing a laugh. Now, however, they are equally passionate about their community advocacy. “Even though we are a woman’s club and we’re advocating for women and girls and their education, we also added boys as well who are wards of Children’s Aid and we did that with the help of the Lions Club,” says Ms. Wickham of their social programs. Over 50 per cent of CAS’ wards, adds Ms. Horsted, are boys and that was an essential statistic in looking at how they, as a group can make a difference. “By reaching out to the other partner organizations, we have been able to support the boys in 2018 and there were more of them that showed up than the girls,” she says. “It is just a feel-good thing and a very good reach out to the community. It is an incentive program for young wards who need an extra push to stay in school so they could go on to higher education (university, college, or training program) because most of our work with higher education came through scholarships, but these kids weren’t going to make it there if they didn’t stay in school. Being a member of the CFUW, they agree, is feel-good in itself. Each meeting, they said, is a learning opportunity and that’s what keeps them coming back for more. For more information on the Canadian Federation of University Women (Aurora-Newmarket), visit www.cfuwauroranewmarket.com. Tickets for An Evening of Art, Music & Laughter, which will feature pianist Emanda Richards and comedian Ken Roche, are on sale now by calling Angie at 416-846-6684 or Karen at 905-887-4277, or by emailing karenstrype@hotmail.com. Doors open June 14 at 6.30 p.m.